In February the THAT Group presented new proposals to redevelop this site to provide a range of retail units, offices and cafe/restaurant space and public realm improvements shown in the computer image (CGI). Planning permissions in 2010 and 2013 were not built but remain relevant to the height and mass of the replacement building. In 2017, the Council discouraged a third redevelopment proposal, this is the fourth. The empty 1960s development would not be an architectural loss. There is strong local opposition to the proposal. Many consider it too large for the site. The Society’s Major Sites Group decided not to oppose the scheme; we judged that the Council would have no realistic prospect of successfully defending a planning appeal against a refusal. 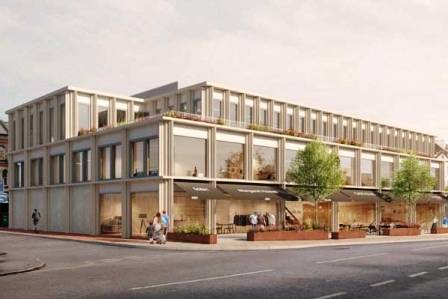 Earlier proposals included flats, this scheme is entirely commercial it lies in a designated primary shopping area within the Clifton Conservation Area. Local policy demands that development delivers high quality urban design and contributes positively to an area’s character and identity. The surrounding local character varies from grand Georgian residential to humbler 19th century commercial. The Society suggested improvements to relieve the building mass. One could be to set the first floor further back. An alternative could be to articulate the first and second floors either by a vertical architectural feature or by a set-back/forward. The Society is unconvinced by the glazing of the bays on the first floor with a single pane. The effect of the first-floor openings contrasts unfavourably with the fenestration pattern of the Boyce’s Avenue and King’s Road elevations. The Society cannot assess the impact of the development on the setting of the Grade II* listed Mortimer House from the CGIs. This remains for the Council to assess. It would lessen the building’s impact if one bay of the middle floor overlooking Boyce’s Avenue were set-back in the same manner as the set-back at the King’s Road end of the elevation. On this site, plant must be contained within the building, not sited on the roof. The Society welcomes the set-back of the building from Clifton Down Road. It would be attractive to introduce a line of planters to mark the division of the public realm from the private spill-out space. We infer that this scheme, will include the funding to improve Boyce’s Avenue and that there will be improvement of the pavements and road space of King’s Avenue, which construction will damage. Bristol Civic Society’s full response [PDF, 138KB] Right-click to download, click to view.